The weeks fly by quickly, don't they? Especially when you are renovating a whole room in just five weeks. It has already been a week since the launch of the spring One Room Challenge. You might recall from my first post that we are making over our dining room to create a more sophisticated space that coordinates with our newly renovated foyer. We progressed fairly well considering that we're doing all the work ourselves and both my husband and I were busy with other things every single day of the week. Things like our regular work and orthodontic appointments and then an entire weekend taken up by our daughter's dance competition (me on duty for hair, makeup and cheering on) and our son's basketball tournament (he on duty for driving and cheering on). Our foyer makeover was the first significant room overhaul that we had ever done. Naturally there is a learning curve to any new process. One significant note that we took away from that room makeover was to stay as organized as possible. 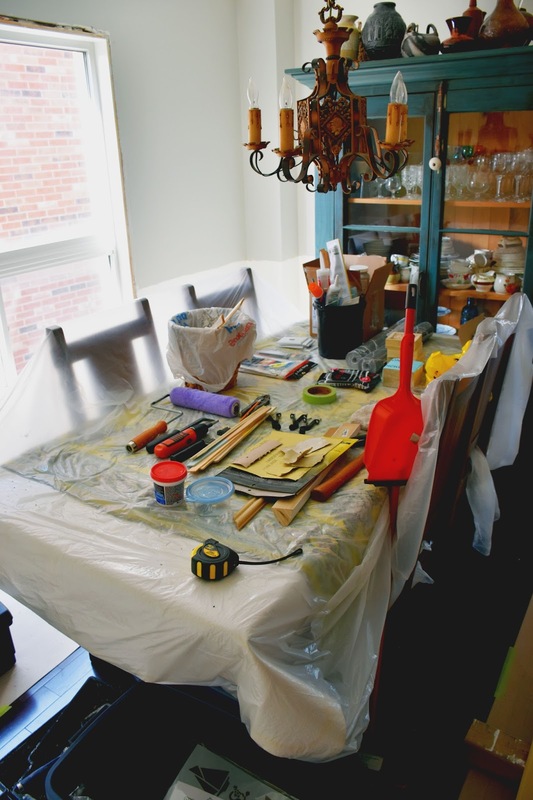 Yes there is sure to be added chaos in the house - with furniture moved to other rooms and various tools, sandpaper and scraps of wood lying about. 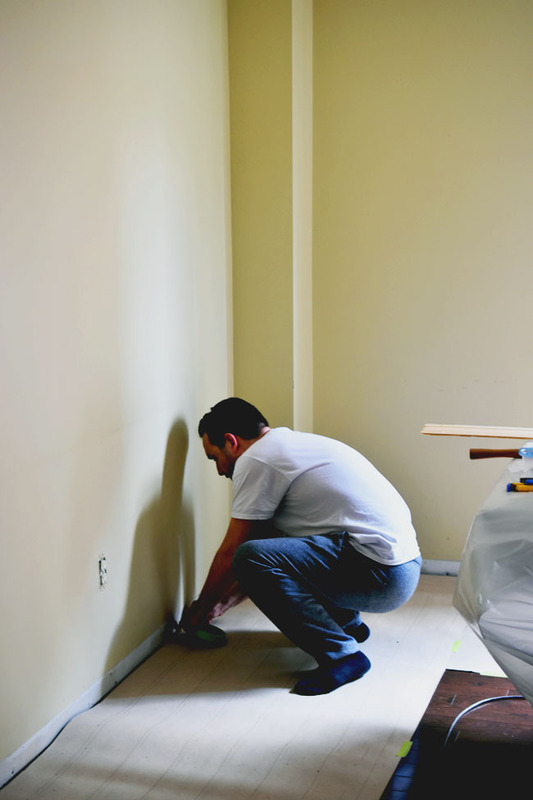 Essentially we took some more care in the preparation stage of the room renovation. We covered the hardwood floor with brown builder's paper, which we taped on with painter's tape. We covered the dining room table (which is staying) with a table protector, a thick tablecloth and a thin plastic sheet. That enabled us to lay out all of the smaller tools, nails, paint brushes, sandpaper, etc. on the table so they are in view and easily accessible. And Jolene is not able to reach her favourite sandpaper snack. Although she did rip off a bit of builder's paper to munch on. Oh Jolene. We also put any nails and screws into a small lidded container so they wouldn't end up underfoot. And I swept up and threw away the pieces of old trim as my husband removed them. Removed accessories from the room. Took down the curtains and rod. Stripped out the old baseboards, window casing and door casing. Painted the lower portion of the walls with two coats of Benjamin Moore's Simply White. 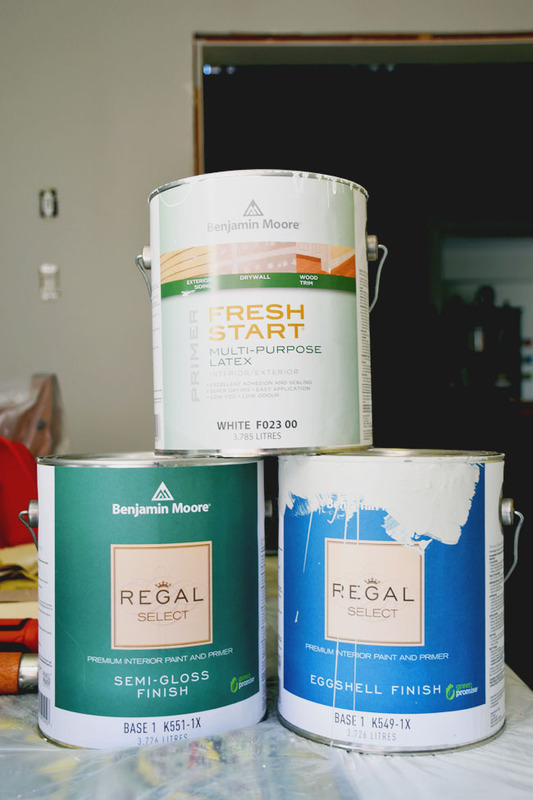 Primed our Metrie window and door casing with Benjamin Moore's Fresh Start. Painted the window and door casing with a coat of Simply White. 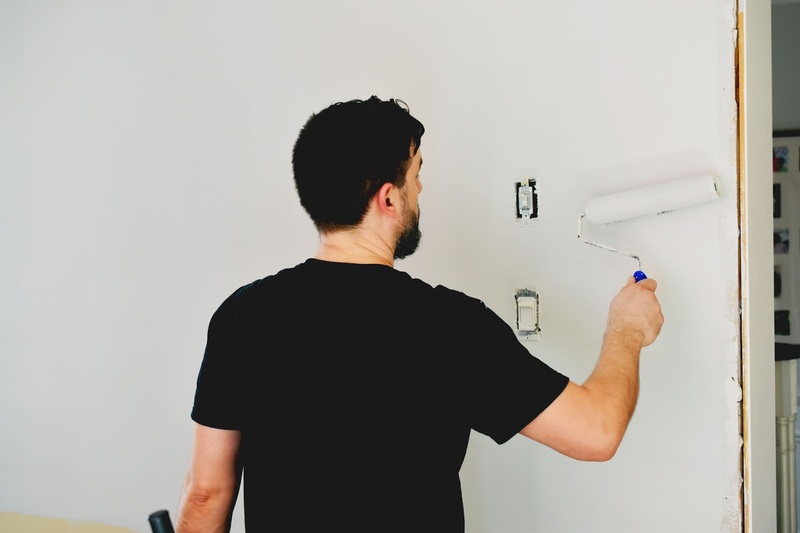 I don't think there are any hard and fast rules about what order to paint walls and trim in. 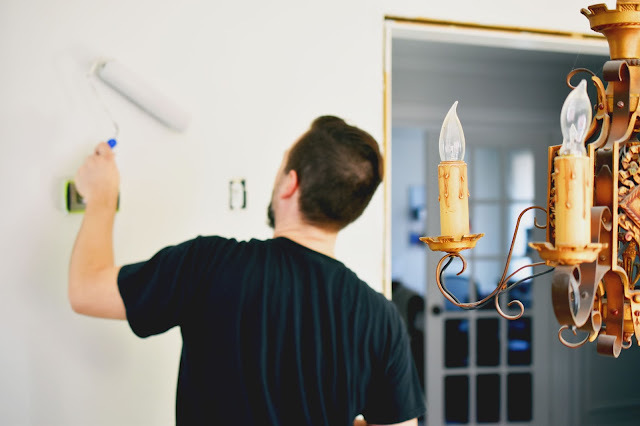 When we painted our foyer, we put one coat of paint on the mouldings before installing them. 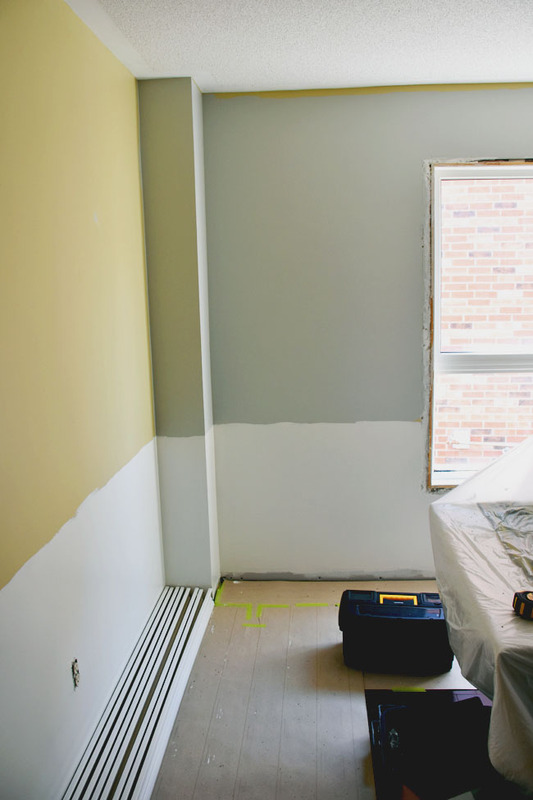 Once they were installed, we painted a second coat on the mouldings and painted the walls at the same time. We didn't want to paint the trim and then ruin the paint by banging nails into it. For the dining room, though, we decided to paint all of the trim before installing it. 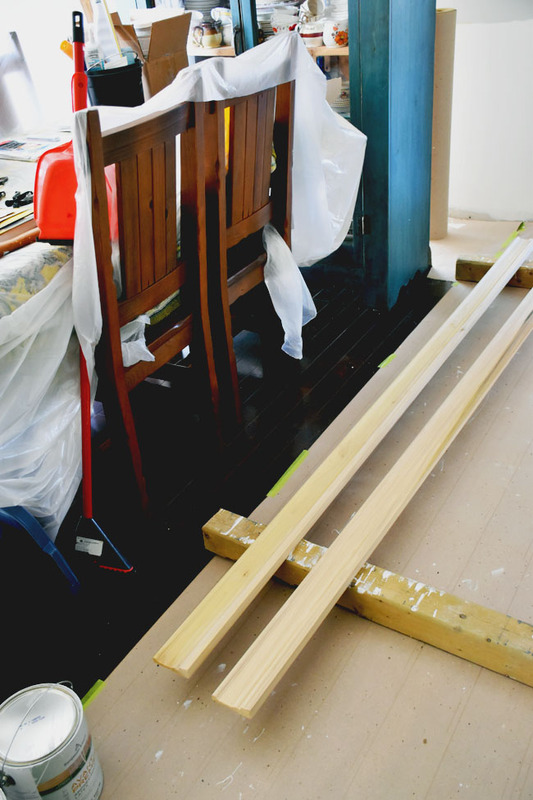 It seems to go much quicker if you lay the trim out across some blocks of wood and paint the lengths of it in one go. We also painted the walls entirely. We figure we can then touch up any areas of the trim that we need to once it's installed. We are going to create a feature wall with the Graham & Brown Innocence charcoal and silver wallpaper we selected. We're going to pick our paint colours for the china cabinet we bought via a local Facebook buy and sell. We're going to begin installing the Metrie French Curves Scene II casing, poplar baseboard and crown. Four more weeks. Easy peasy, right? That baseboard looks gorgeous, I can't wait to see this space come together! We have the same Metrie trim in our foyer and it's so pretty! Thanks so much!